Dad's special day is right around the corner and what better way to celebrate than with a dinner party just for the world's best father. 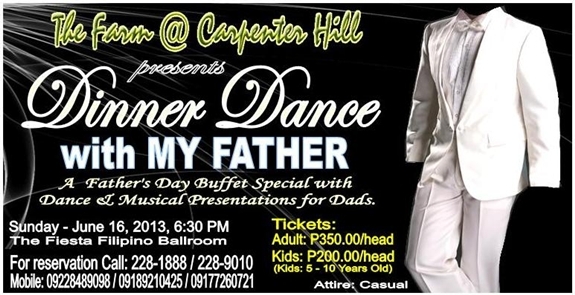 This Sunday celebrate Dad with The Farm @ Carpenter Hill as they present "Dinner Dance with My Father". Spoil dad in this buffet special with dance and musical presentations. Tickets are priced at P350 for adults and P200 for kids 5-10 years old. Contact the numbers at the poster below for reservations.